Mars has two small moons, Deimos and Phobos. Deimos is smaller and more distant from Mars, while Phobos is quite close to the red planet. Its orbital radius only 2.8 Mars radii, compared to our Moon at 60 Earth radii. Phobos is so close to Mars that it orbits the planet three times a day. It’s also so close that the small moon is doomed. We’ve known for a while that Phobos’ time was limited. Tidal forces between Phobos and Mars cause the moon to move ever closer to the planet. Measurements of its orbit since the 1950s have found its orbit is decaying at a rate of about 1.8 centimeters per year. 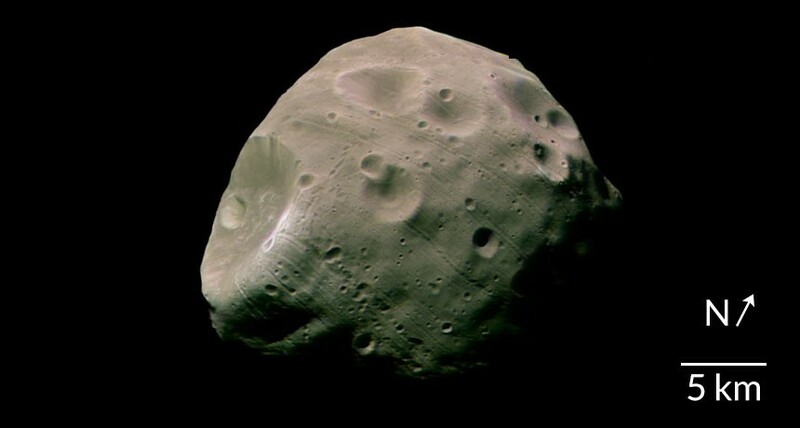 This and the fact that early observations of the moon had a rubble-pile look to them led some astronomers to speculate that Phobos could be artificial. More recent observations show that it is natural in origin, and (along with Deimos) was likely captured from the asteroid belt. The inward spiral of Phobos means that it will only be around for about 30 million years. By then it will either be broken up by the tidal forces of Mars, or it will remain solid and impact Mars. Recent observations of the moon point to fragmentation. In fact it may have already begun. Notable on its surface are long grooves. If Phobos has a rubble like interior with a thick outer layer of dust, then these grooves are what you’d expect from tidal forces. If that’s the case, Phobos will gradually break apart, and may even form a ring system around Mars. There has been talk about sending a mission to Phobos to land on the moon and study its interior. If that happens we may find out just how much time Phobos has left.